The first old fashioned homemade applesauce recipe is a favorite of mine and is cooked in the crock pot. There is no need to "smash" the apples if you like it a bit chunky because the slow cooking will do it for you. It only takes 4-5 hours on high. Ready to get started? More apple recipes at the end of the page. Add the ingredients to the crock pot and cook on high for one hour. Stir well and set temperature to low - cook for another 6 hours. You may also cook it for 4 to 5 hours on high. Works well with McIntosh, Rome, Jonathan or Golden Delicious. Or you may use half red and half green apples for a depth of flavors. Sugar is up to you, this recipe does not have sugar in it. I would add 1/2 cup or so if you do. You may also taste it when it is done and add more then. You can also use a potato masher for smoother consistency when it is done. When you have a wonderful homemade applesauce recipe, you must make one of my homemade applesauce cakes. PREHEAT oven to 350 degrees. Grease and wax paper line a 9x13 pan. Sift the first 9 ingredients together. Add raisins and nuts and toss to coat. Cream shortening and sugar together until light and fluffy. Add eggs, one at a time, mixing well after each addition. Add dry ingredients alternately with applesauce. Pour into prepared baking pan and bake for 50 minutes or until toothpick inserted in the center comes out clean. This applesauce cake recipe is delightful and spicy - a wonder with the caramel frosting. You may use the frosting recipe on the cake above also, if you wish. Don't want to leave him naked do you? Melt shortening in large saucepan; add applesauce, white sugar and spices. Heat thoroughly. Stir in flour and baking soda. Add egg and mix well. Pour into prepared baking pan. Bake for 40 minutes. Melt butter in saucepan; add brown sugar and boil over low heat for two minutes, stirring constantly. Add milk and continue stirring until mixture comes to a boil. Remove from heat and cool. Add powdered sugar gradually, beating well after each addition until you have achieved spreading consistency. Spread over cake. The kids will love this twist on the applesauce cake recipe. PREHEAT oven to 250 degrees and grease a tube (angel food cake) pan. Sift 2 cups flour over the chopped gumdrops, raisins and nuts; set aside (so they don't float to the bottom of the cake when baking). Cream butter and add sugar, beat until light and fluffy. Add eggs, one at a time, and beat well after each addition. Whisk the remaining 2 cups of flour, cinnamon, cloves and salt together. Add to the creamed mixture alternately with the baking soda water. Fold in gumdrops, raisins and nuts. Bake for 2 hours in the prepared baking pan, and check for doneness with a toothpick. 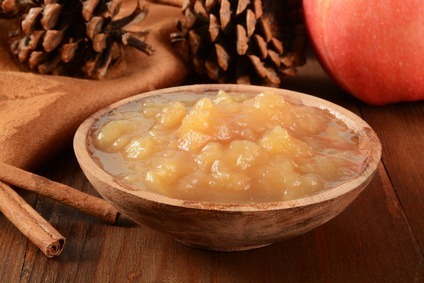 I have more than just a homemade applesauce recipe, check out more recipes below.